Credit: Anthony Wellington Phills, branding specialist of Disney’s ‘Million Dollar Arm’ and founder of Caribbean Commerce Magazine/Media, Calypso Cloud and Blinglet Inc.
News Americas, NEW YORK, NY, Tues. May 27, 2014: “Advancing Wealth” is the theme of the fourth edition of the New York Summit, Invest Caribbean Now, the biggest investment forum on the Caribbean outside the region, set for June 4, 2014 at the prestigious Harvard Club of New York. Now in its fourth year, the Summit brings together heads of state and ministers of governments, private sector leaders from around the world including China, Russia, Africa and the United States, NGOs and investors to network and focus on the varied opportunities in the Caribbean. Invest Caribbean Now 2014 will focus on transformation: unlocking the competitiveness of the Caribbean economy through alliances while focusing on new and innovative engines of growth that can increase the region’s bottom line, its infrastructure and its human capital. The summit will do this through several panels beginning with the ‘Global Trends & The Caribbean’ panel featuring Janine Craane, Managing Director and Global Institutional Consultant, Merrill Lynch; Ambassador Jamie Vargas; Sergio Millian, President of the Russian-American Chamber of Commerce; Anthony A. L. Adjasse, President / CEO, Allied African Nations Chamber Of Commerce; Larry Lee, President, China Daily and moderator Valence Williams, Vice President of AEGIS Capital; as well as the’ Bejing-Caribbean Tourism And Investment Opportunity’ panel featuring Dr. Ma, Lin Deputy Secretary-General of Beijing Municipal Government; Cao, Pengcheng, Vice Chairman, Beijing Municipal Commission of Tourism Development, Li Li, managing director, China American Business Development Center, Richard Nixon, NATCOM International and past Chargé d’ Affaires at Embassy of Grenada to China and moderator Arthur Piccolo, Chairman, New Sports Group/Bowling Green Association. 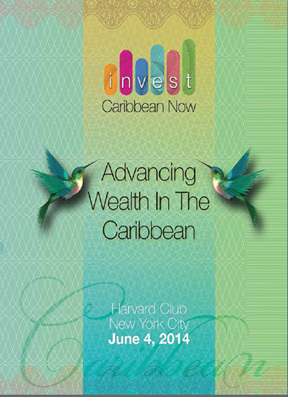 Additionally, the first half of the event will include a keynote address by Harvard graduate Dr. Isaac J. Newton, of Paramount Communications Consultancy; a spotlight on specific investment opportunities in Trinidad & Tobago with Minister of Trade, Industry, Investment and Communications, Vasant Bharath; an investment announcement on the Caribbean Market Village of St. Lucia and a focus on ‘Advancing Wealth In The Caribbean With Technology’ with Trinidad-born, LA resident, Anthony Wellington Phills, branding specialist of Disney’s ‘Million Dollar Arm’ and founder of Caribbean Commerce Magazine/Media, Calypso Cloud and Blinglet Inc. The early afternoon session will focus on two new sectors that can empower Caribbean economies using its abundant sun, sea and sand natural resources. Colin Childress, CEO/Founder, Global Med Choices, Turks & Caicos; Dr. Paul Angelchik, Founder and CEO, American World Clinic; Donna G. Miller, Founder/President/CEO, Life Guard International – FlyingICU/Fixed Wing Air Ambulance; Patrick Goodness, CEO, The Goodness Company, Costa Rica and moderator Christopher Chaplin, Vice-President, Invest Caribbean Now/Hard Beat Communications, Inc., will discuss how the region can grow its economy with medical tourism while Ambassador Angus Friday, Grenada’s Ambassador to the US; ‎Diana Jensen, Senior Manager, Renewable Energy at the US’ Overseas Private Investment Corporation; Mark Austin, Venture Partner, Bright Capital; Raul Slavin of Aspenall Energies; Jacques-Philippe Piverger of MPowered and moderator Justin Locke of Sir Richard Branson’s, Carbon War Room will focus on how governments can save on their energy bills by switching to clean energy. ICN 2014 will conclude summit discussions with a focus on ‘The Caribbean Diaspora as A Real Source For Investment’ with Qahir Dhanani, Private Sector Development Specialist, the World Bank Group; Leigh Moran, Program Manager, International Diaspora Engagement Alliance” or “IdEA;” Brian Lilly, Founder, One Caribbean Television; Dr. Marlyn Morris, Chair of the Board of Trustees of the Caribbean Council For Economic Development and Irwine Clare, Advisory Board Member, Jamaica Diaspora USA, NE & CEO, Caribbean Immigrant Services and a special announcement and sneak peak at his tropical collection with Woody Wilson of Beverly Hills, designer to stars like Brad Pitt. This year’s Invest Caribbean Now will wrap up with a high powered networking reception that will include remarks by Hollywood actor Malik Yoba, the exciting presentation of the ICN Leadership Award to Hon. Gordon ‘Butch’ Stewart, OJ, CD, Hon. LLD, Chairman of Sandals Resorts International and the presentation of corporate awards to DHL Caribbean, HBO Latin America, One Caribbean Television, First Caribbean and interCaribbean Airways. Presenters for ICN 2014 include: Hard Beat Communications, The Caribbean Tourism Organization, One Caribbean Television, The Woody Wilson Collection of Beverly Hills, The PR Newswire, the Caribbean Commerce Magazine, Blinglets, The Caribbean Council for Economic Development, the World Tourism Cities Federation, China Daily, InvesTT, the Chinese Business Development Center, the Sino-American Friendship Association, Martinique Promotion Bureau- CMT USA, CaribPR Wire, News Americas Now, the Jamaica Observer, CaribSeek, WINN-FM and GCaribbean Magazine.